Rail Trails - Where Are Our Priorities? There is a strong possibility that a 6.36-mile abandoned Pan Am right-of-way in Concord and Boscawen will be broken into individual lots and sold off to private parties. The Concord-Claremont Line, as shown in Figure 1, was abandoned many years ago. The State did not exercise its option to buy and preserve the corridor and today , the 7.9-mile section in Concord is broken up into 44 parcels. Friends of the Concord-Lake Sunapee Rail Trail are planning and coordinating with private owners and communities to determine the best way to restore or route a workable trail (watch video below). The rail trail was presented to the Concord City Council as a project that would not require city funding, although the City would be responsible for maintenance once it was completed, However, the costs of the trail have exceeded current funding and the friends of the trail are working to raise enough capital to fund the project. 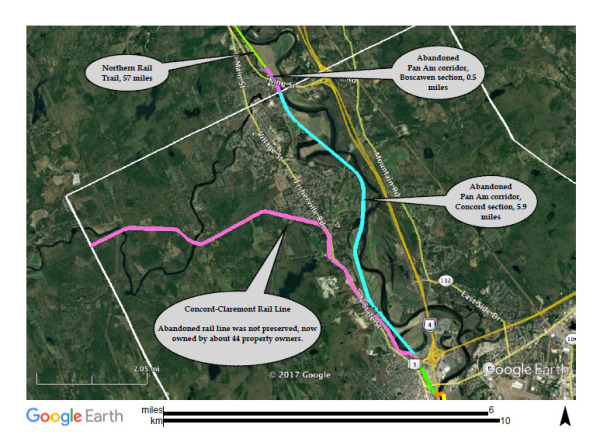 ​The State of New Hampshire, Department of Transportation (NHDOT) has many high priority projects, including rail trails, in its Ten Year Transportation Improvement Plan, but this valuable rail corridor is not one of them. 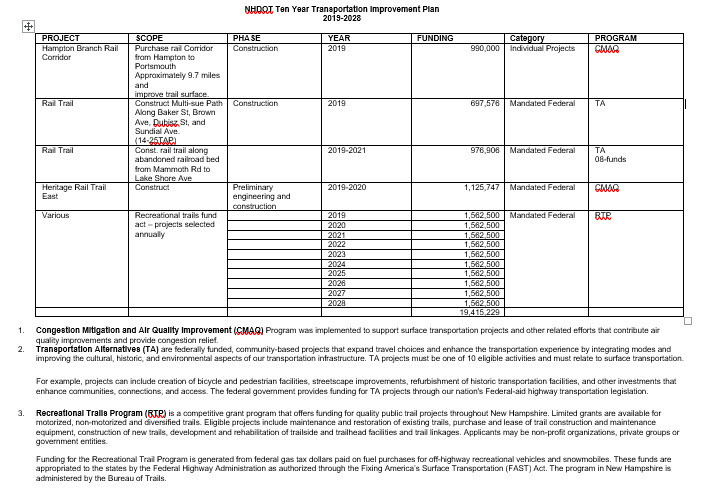 As shown in the table below, NHDOT many wonderful has rail trail projects planned for each of the next ten years, but theses projects only represent 0.05% of the total $3745.54 million dollars. 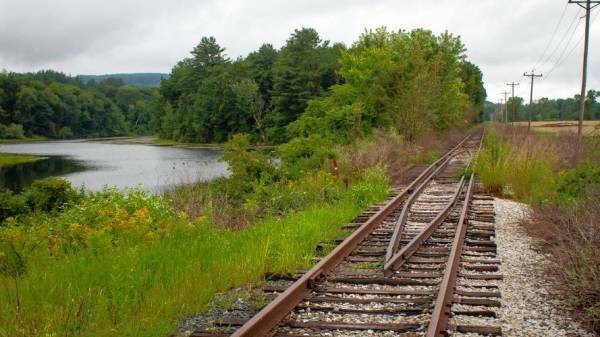 ​​The Rail to Trail Conservancy (RTC) states on its website that “From the Massachusetts state line to Lebanon, rail-trail development is booming in New Hampshire. 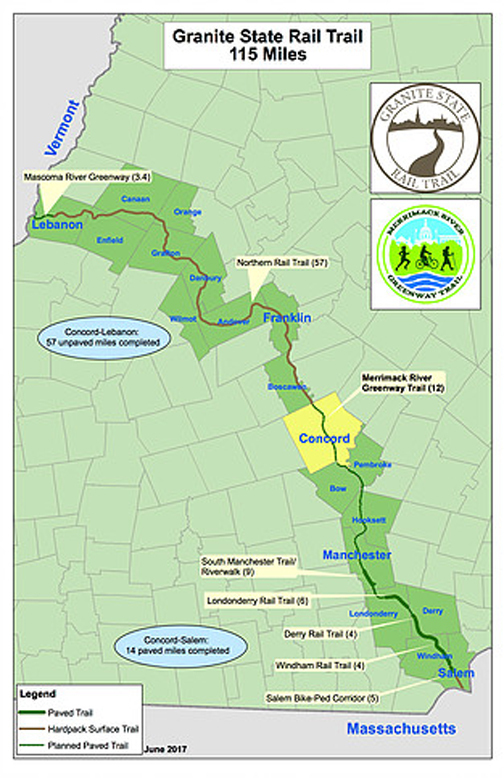 As shown in Figure 2, the Granite State Rail Trail, when complete, will run 115 miles from the Connecticut River to Methuen. Currently, 62 miles of the trail have been completed, with construction projects in Londonderry and planning underway for the Merrimack River Greenway in Concord. 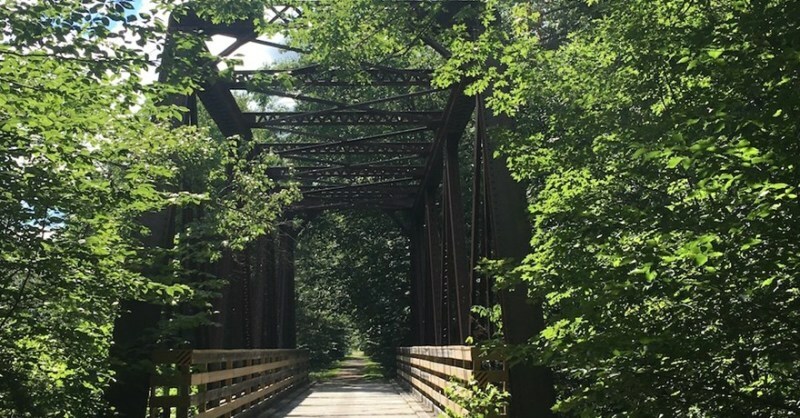 In southern New Hampshire, the approximately eight miles of the combined Derry Rail Trail and Windham Rail Trail represent the longest paved section of the Granite State Rail Trail—and the longest section of paved abandoned rail corridor in New Hampshire! Trail users spend tourism dollars and impact local economics. Crime - Although trail opponents often express fears that a trail will increase crime and cause safety issues, the actual documented impact of trails is that they reduce criminal activity, increase regular monitoring and improve the public safety of previously disused spaces. Designated bike lanes: Continue to include design of and designate bike lanes in areas within NHDOT jurisdiction. Coordinate with municipalities / planning commissions for bike lanes consistency on other roadways. Interconnected bike paths: Continue working on path networks until bike paths are connected between towns. Knut J. Roalsvig, M.D., Treasurer of the Derry Rail Trail Alliance, states, "I've been in practice in the greater Derry area since 1988. I was the founder and currently the Medical Director of Granite State GI Consultants in Derry. As a physician in town I can appreciate the many health benefits of a paved trail that can be accessed year-round, and see this as a development that can add to the outdoor recreation opportunities and overall quality of life here in town. As this area grows in population and density these tranquil outdoor areas will become even more valuable to us. John P. Daley, M.D., Liaison to Londonderry Trailways, grew up in Wisconsin, and has been a family physician at Derry Medical Center for 14 years, residing in Londonderry. He attended college at Harvard, got his medical degree from the University of Wisconsin, and attended residency at Brown University, where he rode his first rail trail along Narragansett Bay. He currently is a partner at Derry Medical Center and also serves on the board of Community Health Services in town. He has been a member of Rails-to-Trails Conservancy for 16 years.